Giuseppe Verdi’s final opera, Falstaff, grew out the composer’s desire to write a comic opera (his first in 50 years) and his reverence for Shakespeare, upon whose work Verdi had previously based two of his operas, Macbeth and Otello. When Verdi expressed his interest in composing a lighthearted piece librettist Arrigo Boito turned to The Merry Wives of Windsor as the source, with bits of Henry IV Parts 1 & 2 added to the mix. The collaborators initially kept their work secret, since Verdi was still somewhat uncomfortable with comic opera and wanted the option of cancelling the production if dissatisfied with the result. In the event the premiere at Teatro alla Scalla on February 9, 1893 was a triumph, but true to form Verdi continued to “tweak” the score for subsequent premieres in Rome and Paris. Part of Falstaff’s success may be attributed to the fact that after a long and productive career Verdi, nearing 80, was no longer concerned with pleasing audiences, critics, or posterity, but was writing to please himself. Whether it was his intention or not, at the time of the opera’s premiere many critics wrote that Verdi was composing “the music of the future,” and history has borne out that assessment. 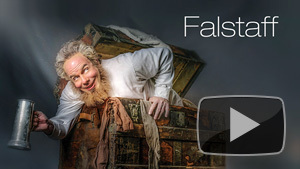 After a period of neglect following Verdi’s death, Falstaff is now rightly regarded as one of opera’s greatest masterworks and the beloved composer’s crowning achievement.